Meet our English-speaking guide in your hotel’s lobby and let’s depart for Ayutthaya. 09:30 We start visiting the famous Bang Pa-In Summer Palace. This Palace was first used by the Royal Family as their summer retreat during all the 17th century. However this Palace was later destroyed with the coming fall of the Kingdom of Ayutthaya and it was really restored by King Rama IV in the middle of the 19th century. Actually most of the buildings that now exist are dated from his reign, King Rama IV regularly spent his summers here. All the restored structures represent a large variety of architectural styles with large parks around ponds and waterways. Now the only royal residence open for us to visit is the Chinese styled Wehat Chamroon Palace, constructed entirely by materials imported from China. We will be able to visit also the Italian style palace, an interesting circular pavilion with steps leading to it’s pool, across one of the waterways. Enjoy taking pictures and sightseeing the extensive gardens and all the European statues as well as monuments built by King Rama V in memory of his family members. 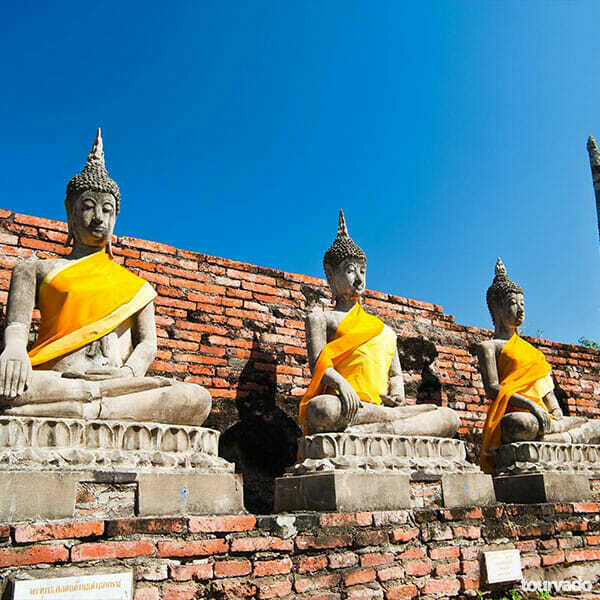 10:30 We will continue to the famous Wat Phananchoeng, The most revered monastery revered by the citizens of Ayutthaya. 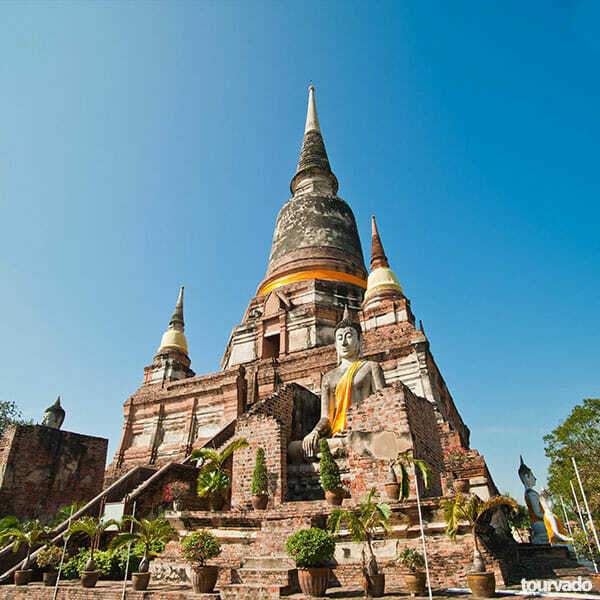 We visit Wat Yai Chaimongkhon and it’s large pagodas. 12:45 Lunch will be provide at riverside restaurant. 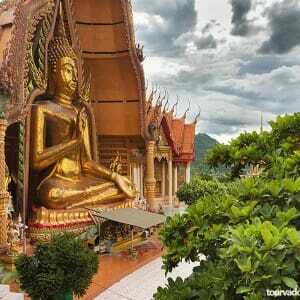 13:30 Visit Wihan Phra Mongkhon Bophit. Phra Mongkhon Bophit, a large bronze cast Buddha image was originally enshrined in the open area outside the Grand Palace and later covered by a building in the reign of king Songtham. 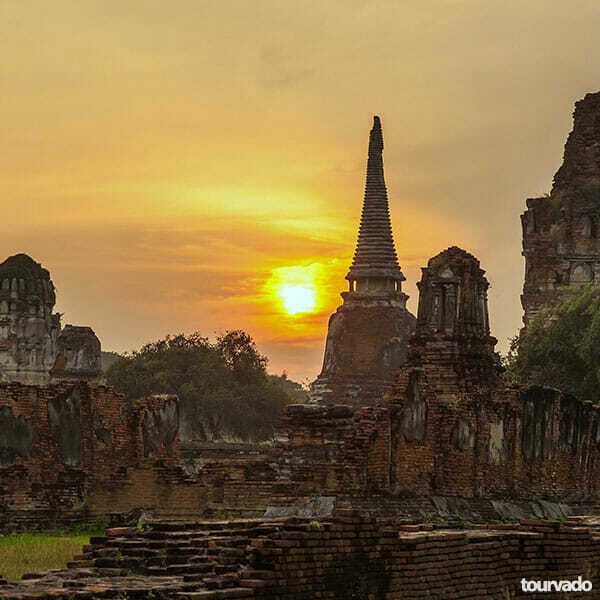 During the fall of Ayutthaya, the building was badly destroyed by fire. The one currently seen was reconstructed, but does not have as beautiful craftmanship as the previous one. 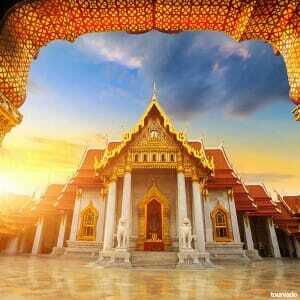 The open area east of the sanctuary was where the royal cremation ceremonies took place. 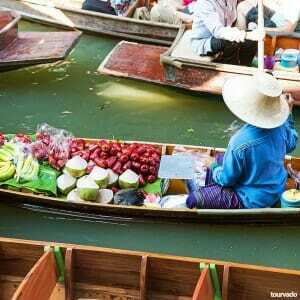 15:00 Leave form Ayutthaya pass green paddy fields, villages, and temples then return to Bangkok. Ayutthaya Summer Palace Tour. 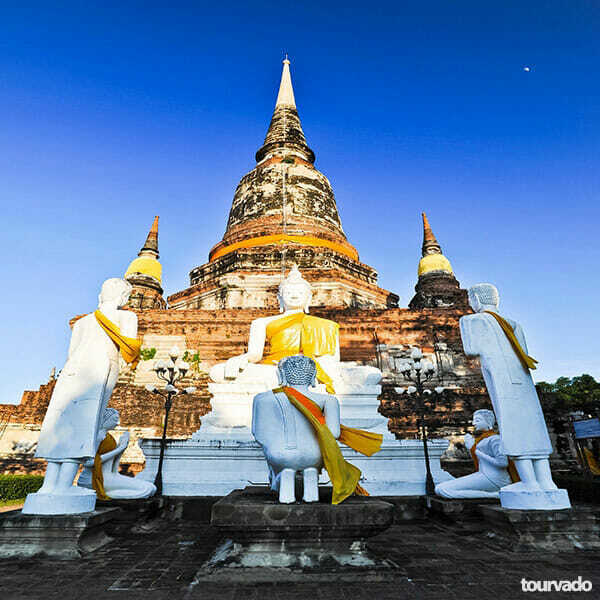 Visit the most interesting and historical sites in Ayutthaya including the wonderful Summer Palace, Wat Phananchoeng, the Wat Yai Chaimongkho, Wihan Phra Mongkhon Bophit and enjoy this amzing destination. 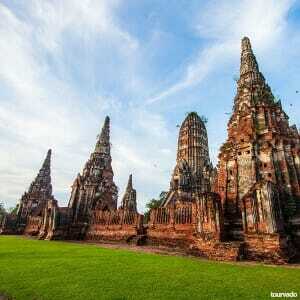 Ayutthaya is located 76 kms. 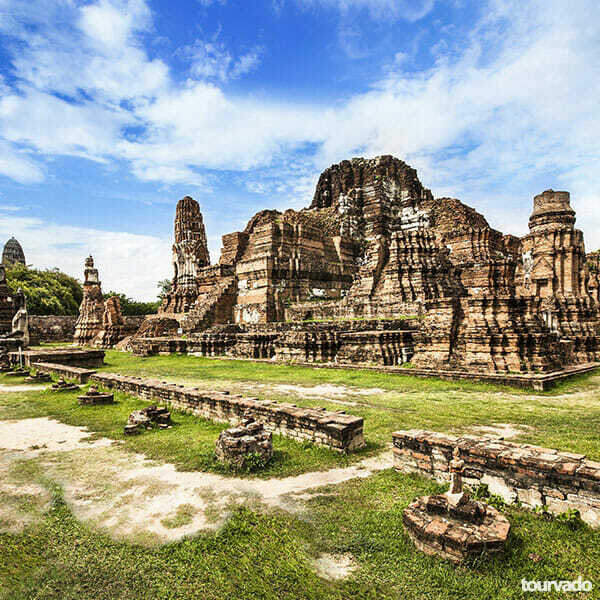 north of Bangkok and was one of Indo-China’s most prosperous and rich cities, in Thailand is a major historical attraction. 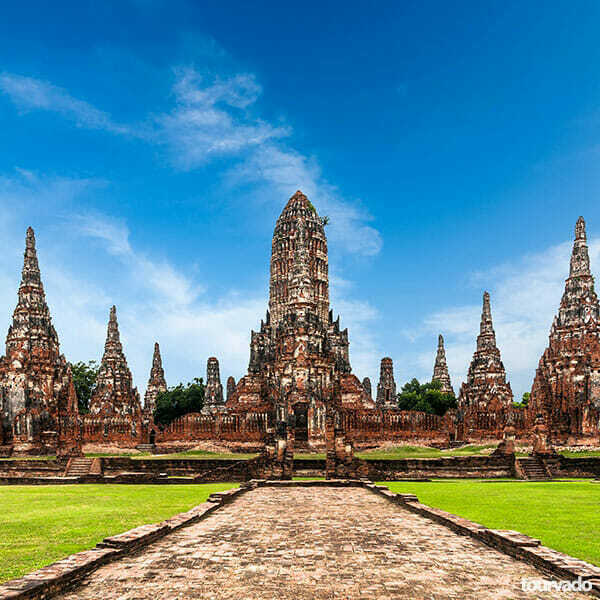 The grandeur of Ayutthaya historical complex is nowaday reflected by it’s numerous magnificent structures and ruins all concentrated in and around the city island which is surrounded by the River Chao Phraya, by the Pa Sak and the Lop Buri Rivers. The entire area is well conserved as a magic historical park and was included in UNESCO’s list of the World Heritage since 13 December 1991.